It is officially summer, wether or not it feels like it. Summer means oh so many things to me: Barbecues, family reunions, flip-flops, cracked heels (more on cracked heels later), cool drinks, and tasty treats. I don't know about everyone else, but the summer heat can really kill your appetite. I love to have some light desserts when it comes to entertaining (and indulging). Meringues are light and won't sit heavy in your stomach on a hot summer days. They are very versatile and can be dressed up (with syrup, berries, chocolate, or whipped cream) or be served as a tasty cookie as is. Most meringues are also naturally gluten free-making them a great choice for those of us who live with Celiac Disease or who are on a gluten-free diet. Don't be scared off by the fact that they are gluten free-my husband enjoys these as well. You can find the recipe here. This particular variation was inspired by some slightly over ripened cherries that I had sitting in my refrigerator. I hope that you enjoy. The syrup is made by pitting and pureeing ripe cherries. Cooking over medium heat with some sugar, corn syrup, and a drop of food coloring. Cook until mixture begins to thicken. 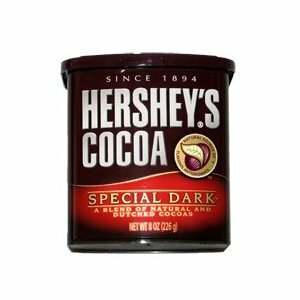 I really love Hershey's new special dark baking cocoa. It makes everything oh so delicious. If you try it out let me know what you think. I have to add that as someone who cooks for a gluten free hubby and is not gluten free, myself, I basically eat all gluten free food and it is delicious. These must be really yummy with those cherries.